Notify the office in the morning before 9:00 am if your child is absent due to illness or injury. Please be specific about illness (flu, strep, chicken pox etc) because it is helpful in the control of communicable disease. 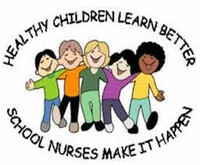 If your child has a serious illness or injury that affects school participation, please notify the school nurse so that a plan can be implemented to meet your child’s needs. When should my child stay home because of illness? Chicken Pox: child may return to school 5 to 7 days after onset of rash, with all sores dry and scabbed over. If your child has any of the following health concerns, please notify the school so a plan can be developed and put into place to best help your child meet his/her needs. Kindergarten students are to have Physical, Dental and Vision examinations prior to school entrance. Vision and hearing screenings are done annually at school. Vision: The school provides a vision screening annually for Junior Kindergarten through 5th grade. Referrals will be mailed home if further evaluation is needed. Hearing: The school provides a hearing screening annually for Junior Kindergarten through 2nd grade. Referrals will be mailed home if further evaluation is needed. A doctor's signature with written instructions. Written consent from the parent for the school to give the medication. Medication in a properly labeled prescription bottle. Immunizations - "IT'S THE LAW"
Parents are required to have their children immunized on schedule and keep accurate records. If a student is unable to receive immunizations for medical, religious or personal conviction reasons, a waiver must be signed and given to the school. Notify your child’s school each time your child receives an immunization. Schools are required to keep records and review annually the immunization law. Parents are notified by a legal notice. Dunn County Health Department offers immunization clinics to those qualifying. Please call (715) 232-2388 to get more information or make an appointment.